Try this Ultimate Guide to the World! Global Road Warrior is a fantastic resource for getting all the information you would want about a country, but in an easily digestible form. While there is plenty of useful information for those who plan on traveling to a foreign country, there are also a multitude of facts that can help in any paper or project. Global Road Warrior lists everything from basic facts about a country’s geography, history, and demographics to more detailed sociological aspects such as the structure of their education system, common national recipes, religious beliefs, and how women are treated in business and culture. For each of the over 150 countries listed, Global Road Warrior provides a snapshot of a foreign culture that helps to better understand life in that country. Imagine for a moment that you wanted to write a paper that examines the way governments are structured in various Eastern European countries. Taking Belarus for example, we can see a whole host of information including when the people achieved independence and drafted their constitution, what sort of legal system the government operates under, and what offices comprise the three branches of government, as well as the names of major representatives. Perhaps you are a culinary student who wants to know what sort of Caribbean recipes you could add to your repertoire. 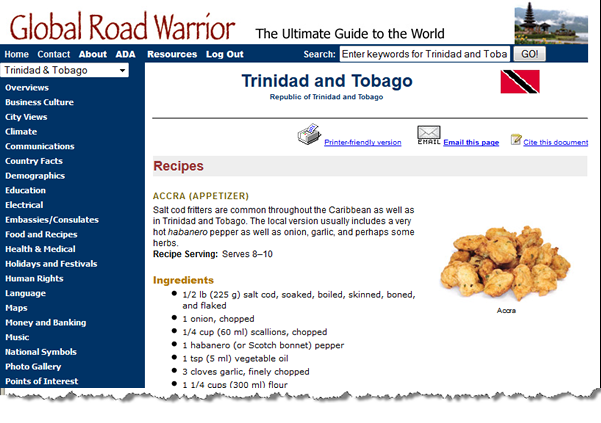 By looking into the Trinidad and Tobago page, you can get a quick description of which culinary traditions came to influence this country’s cuisine, as well as several recipes for how to prepare them. You now have everything you need to fix a batch of accra, salted cod fritters seasoned with onion, hot peppers, and chives, or perhaps sancoche, a stew containing yams, tannia, eddoes, taro, cassava, bananas, potatoes, pumpkin, and plantains. Maybe you find yourself working with a local organization that helps Burmese immigrants that have left Myanmar. You want to get a better picture of their culture, specifically about how the culture views women. The Global Road Warrior page for Myanmar gives details about marriage traditions, including the fact that family names are not common and that a married woman will keep her own surname. You learn that women typically run the household, and they are able to choose who they marry as well as initiate divorce. It is not uncommon for Burmese women to work, especially in the field of teaching or nursing, but if this is the case, she still maintains the household or the responsibility falls on the maternal grandmother. You can see how knowing these dynamics could help when learning how to understand the day-to-day concerns of a Burmese family who has immigrated to the United States.